In recent years, it seems the fairy tales we all grew up with are seeing a resurgence in popular culture. Television shows like Grimm and Once Upon a Time have taken a lot of these classics and fused them into intertwined storylines. This revival has also been seen in the film world as well, with retellings of “Snow White,” “Little Red Riding Hood,” “Hansel and Gretel,” and “Beauty and the Beast” having been released in the last few years, some even so far as to have two versions of the story released in the same year (Mirror, Mirror (2012) and Snow White and the Huntsman (2012)). And yet, while it seems the realm of fairy tale stories has been bled dry, occasionally you will see a new story appear which would fit well in the fairy tale category. This week’s two films are stories that were created recently (i.e., not derived from any of the Grimm works) that can easily hold their own against any classic fairy tales. At the base of a strong fairy tale are two elements: fantasy and love. The fantasy realm engages the imagination of young children and gives them something that older audiences would immediately pass off as impossible. Of course, a lot of fairy tales in their original context were not meant as pleasant stories for children, but that is beside the point. The aspect of love can be applied across a wide range of situations and does not restrict itself to the romantic (or “Eros”) form to produce a good fairy tale. Still, this emotional aspect is perhaps one of the reasons that fairy tales survive for so long, especially when you combine them with a fantasy element. We all want that happily ever after, so these stories give us some semblance of hope. Stardust excels in both of these elements; even if some of its “love” aspects are a bit unorthodox. The story begins with Tristan Thorn (Charlie Cox), and his desire to impress his unrequited love, Victoria (Sienna Miller) with a gift. When he sees a star fall from the sky and land outside his hometown of Wall, he decides that this would be the perfect gift. Of course, at the same time, witches wanting power and two princes wanting their inheritance are searching for the exact same star, with the hopes that it will allow them to advance in the world. After finding that the star has taken the form of a human woman, Tristan drags her back home, but eventually finds himself in the middle of the battle for the star, as well as being truly in love with someone other than Victoria. 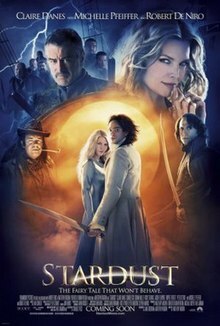 An interesting note about Stardust is that the director (Matthew Vaughn) wanted to make it like a mix of Midnight Run (1988) and The Princess Bride (1987). Considering how much The Princess Bride has influenced popular culture, it’s no wonder that 20 years later, directors are still trying to recreate the magic that Rob Reiner brought to the screen in 1987. And to think that the story it originated from has only been around since 1973, it makes one wonder how many great stories are out there, just waiting to become the next fairy tale (for reference, Stardust‘s story was written in 1998). 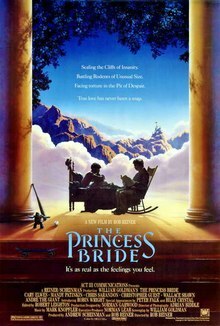 After all, The Princess Bride is probably the most quoted movie of all time, which just goes to show how timeless it really is. Once again, The Princess Bride follows the two elements of a successful fairy tale: fantasy and love. Even to the point of being about “wuv . . . twue wuv.” In a realm known as Florin, many strange aspects of the land include men with six fingers, giants, fire swamps, and rodents of unusual size (although I think these still don’t exist). The pure love of Buttercup (Robin Wright) and Westley (Cary Elwes), torn apart by Westley’s alleged death at the hands of the Dread Pirate Roberts, forces Buttercup to settle for marrying Prince Humperdink (Chris Sarandon). But when the Dread Pirate Roberts enters the scene, and his true identity is revealed, it’s a race against the clock to stop the Princess Bride from sealing her fate with the prince. Will there be a storybook ending?